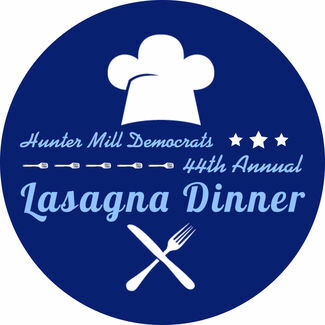 Hunter Mill Democrats: Lasagna Dinner Volunteers! This is where our annual fundraising lasagna dinner gets its power--from the superb volunteer corps that do all the work during the event to make it the most successful committee fundraiser in Fairfax County. Find a slot you can fill, sign up and we'll see you there! And thanks!!!! Questions? Comments? Information? Need to get something off your mind? We're ready! Do you have the amazing family lasagna recipe (or, you know, a Costco membership) and you're ready to bring the results for all to taste? Help us unload and begin transforming the Community Center to a lasagna paradiso! I had done this before with my son. Start off our kitchen world right. Should I arrive at 4:45? or earlier? Still greeting, still checking, still badging! We will call on you as needed for spot help where we may need you; an MVP role! Spot the bidding, get them their papers, celebrate $$ for Dems! Yes, the unsung dirty work but we know our volunteers will come through for us!